Newflands is a New Zealand based company which is well-known for their development of pet supplements. Hoki Oil, otherwise known as ‘Rosie’s Oil‘, started the Newflands journey after having had such a positive personal experience with the oil. Hoki Oil is now the main ingredient in all current and future Newflands products. Today, Newflands sustainable and ethically sourced New Zealand Hoki Oil has been helping many clients wishing to improve the health benefits of their beloved animals. 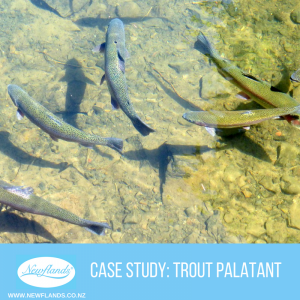 Newflands also have the advantage, with their research and development focus, of being able to use the Hoki Oil and turning it into a custom solution to help suit every animal’s needs. Overall, it took one week for the fingerlings to return to full health, and only 24 hours for the fingerlings to adjust to the change with the Hoki Oil, and after that, they were happily gobbling up their food. Despite Courtney and Dave only having spent a small amount of time using the Hoki Oil they were happy with how quickly the oil changed the fingerlings appetites. It is always great hearing customers success stories with our products and being able to be with our clients along the way. It helps us for our future clients and helps us make sure we are always providing our clients with reliable products that work. Newflands strong focus on research and development continues to enhance and grow our product range with new and exciting health solutions. farm life, hoki oil. Bookmark.